The Lilac-crowned Amazon - also known as the Finsch's Amazon Parrot (Amazona finsch) - is endemic to the Pacific slopes of Mexico, from southeastern Sonora and southwest Chihuahua to southern Oaxaca, where they mostly inhabit humid pine-oak forests up to about 6,000 feet (~1,800 meters) elevation. In the United States, feral populations have established themselves in southern California (Orange Country, Riverside Country, Los Angeles), where this species is found in residential and suburban areas. Breeding populations also exist in the forests of San Gabriel Mountains, California. 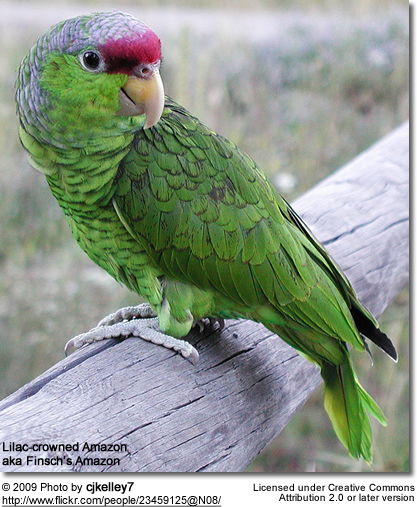 Feral Red-crowned Parrots are also found in California and these similar species are often confused. A small population of Lilac-crowns has been documented in Santa Barbara County (Linden 2006). 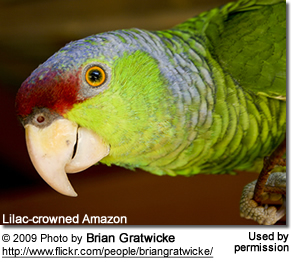 The Lilac-crowned Amazon can expected to live 40 to 60 years. 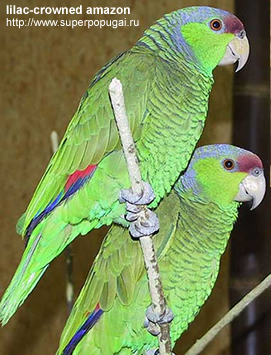 Lilac-crowns are on the small side, compared to other Amazon parrots, averaging 12 to 13.5 inches (30.5 - 34.5 cm) from head to the tip of the tail. They weigh about 11.3 oz (325g). The plumage is mostly green, except for yellow-green face, the red / maroon band across the forehead and the extensive wash of violet-blue on the top of the head (crown) and collar. The feet are bluish. In flight, a red patch of red can be seen in the wings. The outer tail feathers are yellowish-green, except for the central tail feathers which are entirely green. Males and females look alike. For gender identification DNA / Feather or surgical sexing is recommended. The Red-crowned Amazon has a bright red forehead and forecrown and blue markings that are restricted to the sides of the crown. 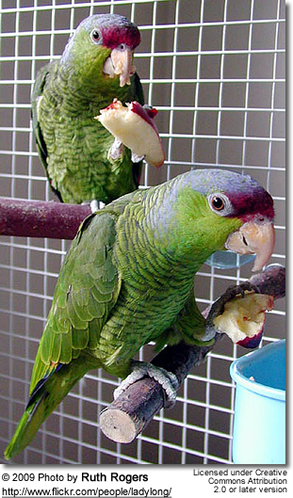 The Lilac-crowned Amazon has a dusky or dark grey cere (fleshy skin above the upper beak); while this area is flesh-colored in the Red-crowned Amazon. The plumage of the Lilac-crowned Amazon is less vibrant. 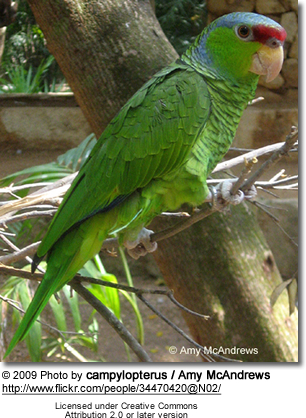 The Lilac-crowned Amazon has a longer tail. Their vocalizations are similar, except for the distinctive squeaky upslurred whistle of the Lilac-crowned Amazon and the downslurred whistle of the Red-crowned Amazon (Hardy, 1973). Within its natural range, this amazon is considered "Vulnerable" due to an estimated population decline of 30-49% over ten years due to habitat loss and degradation; and illegal capturing for the pet trade. A decline in its natural range has been documented. This species has disappeared from parts of its previous range. 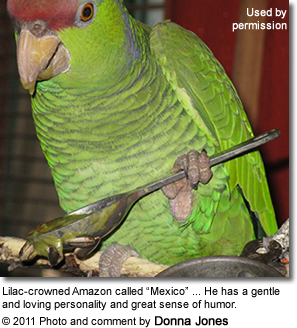 'The Lilac-crowned Amazon is readily available in the pet trade. Lilac-crowned Amazons are considered good talkers; however, the quality isn't considered as good as some of the other Amazon species. Some may never learn to talk at all. They are gentle birds with a quiet demeanor, which makes them a better pet than other more aggressive amazons. They make wonderful companions for the compatible bird owners, and are appreciated for their clowny personality. They enjoy water and should be provided with showers, about 1 a week. If they are not showered, they will do it for themselves in their water bowl, which can make quite a mess. ID: Slightly larger in size. The plumage is somewhat duller. It has a narrower forehead.